Hot this week: Syrian artefacts smashed? Pics of looted Syrian artefacts being intentionally destroyed? These images allegedly show members of an extremist group destroying Assyrian objects that they confiscated from looters. Another piece on the last story. No new info but some quotes from archaeologists saying the smashed pieces look real. A UK national has been fined and deported following a conviction for the smuggling of 15 antiquities. He was picked up in Sana’a airport on 13 January 2014. These looted antiquities were returned from the US, Australia, Germany, Lebanon, Morocco, and Kuwait. Oded Golan, now-notorious antiquities dealer and flogger of the horrible James Ossuary, has this tablet and other antiquities returned to him after being cleared of forgery charges. 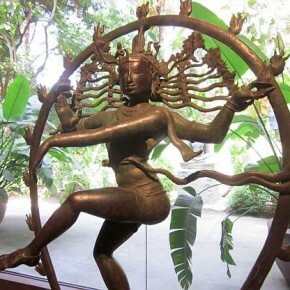 Post about Norton Simon’s return of a smuggled Shiva in 1970 and questions if the museum should be acting like they just did Cambodia a favour. Native Alaskans working for the return of a totem pole taken by John Barrymore and once owned by Vincent Price. Likely confiscated during the Bolshevik Revolution; vandalized and stolen from the Pushkin State Museum ten years later. Found in 1931 buried in a tin can. Background on two ancient Maya cities that were discovered by looters long before archaeologists found them. The Maya site of Noh-Kah on the Mexico/Belize border is being looted and animals are being poached in the protected area. Locals are asking for guards which, they think, will cut down on the looting. Mexico sees the discovery of the oldest and most complete skeleton in the Americas is a good opportunity to raise awareness about the need to protect underwater sites from looting. Wow! Mexico is essentially arguing that film taken in 2012 of the sites of Calakmul and Jaina are cultural property of the nation and any agreement for filming was not a transfer of rights; say that the film has, in essence, be looted and trafficked. What a weird case! Nicaraguan heritage professionals are joining forces to take an aggressive stand against the looting and trafficking of cultural objects. Police chief of the region says that since 2010 they have recovered 15,487 archaeological pieces. One of the few tombs that WASN’T robbed at this site. Amazing find! Archaeologically excavated pieces that were stolen in 2002 on display in a Romanian museum under a false provenance. Two others for sale in Paris. More on the exhibition of 200 artefacts stolen during the 2011 revolution now, recovered and now presented to the public. Although the cases were alarmed and there are 24 hour security guards, 7 pieces were stolen, 3 of which date to the 17th century and are considered unparalleled in Mongolia. Champion of Chinese art … or villain? Was C.T. Loo the 20th century’s top dealer of Chinese ancient art or a criminal who sold away China’s cultural patrimony? It has been discovered that a 3rd of the 8,000 artefacts in the Lucheng Museum in Liaoning. The media is saying that this is on purpose: that this and other fake museums exist for monetary gain. A clear recap of the Koh Ker/Prasat Chen statue story with quotes from Tess Davis. More on the return of statues looted from Koh Ker. Just thought some readers might like it in French. Thursday was the last day this looted statue was on display in California. It is finally heading home. Mark Vlasic offers a short round up of Cambodia return news. Tamil Nadu police’s Idol Wing is seeking help from the Archaeological Survey of India to try to find the original locations of four idols in foreign museums but thought to have been stolen from Tamil Nadu. Pakistani customs impounded 2,210 mediaeval and ancient coins in the Islamabad airport in the posession of a Pakistan national on his way to China. York stone paving stones are hot on the illicit market. These were stolen from the Church Farm House museum which has been closed since 2011. The whole situation with the former museum seems super bad. A little slice of English law for those outside of the UK. Because these items were found by a metal detectorist, they had to be valued then paid for if they were to be kept in a museum. Reporter, yet again, fails to understand the problems caused by metal detecting as a ‘hobby’. I doubt they called a single archaeologist. Two men in balaclavas are seen on a security camera stealing the 160 kg sphinx which was found 40 years ago during archaeological excavations. Recovered in Montreal after being stolen in 1998, owner believes that one is an authentic 1685 Strad. German Jew, preparing to flee Nazi rule, purchases the piece and smuggled it to South America. A vessel carrying the title page was torpedoed and sank!